At the end of Ken Block’s most recent tire-destroying drift madness video (AKA Gymkhana 8), we caught our first glimpse of what Ford was calling the Ford Focus RS RX. We didn’t know much about it, but now we know just how wild it is. 600 horsepower, over 650 lb-ft of torque, and zero to 60 mph in less than two seconds. We sort of inferred that it was for rallycross competition, but in the absence of any information, we were grasping at straws. Was it purely for rallycross? Was it for something else? Would it be available to the public in any way, shape, or form? How does one car? And the answers to those questions we now know are yes, no, probably, and an enthusiastic maybe!!!!!!!! 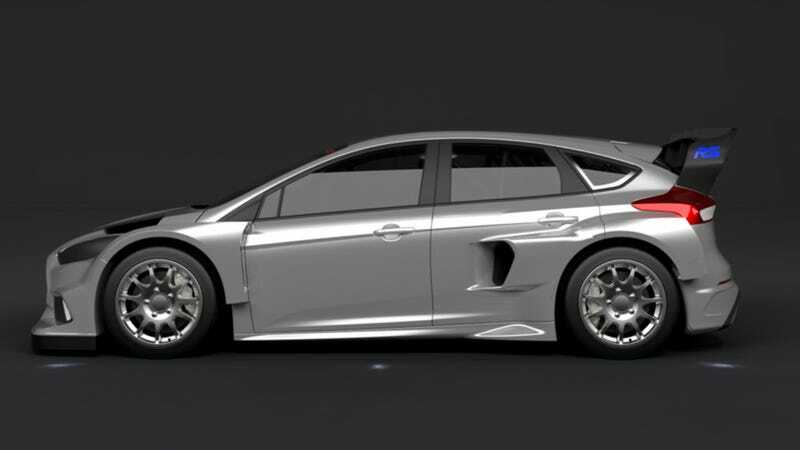 Created by a mixture of Ford, Hoonigan, and British racing outfit M-Sport (which has built a number of Ken’s previous cars), the Focus RS RX will race in the FIA World Rallycross Championship. And while Gymkhana 8 said that we’ll be seeing the new car in Gymkhana 9, we’ll actually be able to get a much better glimpse of it much sooner. The Ford Focus RS RX will debut at the FIA World Rallycross stop in Portugal next month, with Block driving along with teammate Andreas Bakkerud.